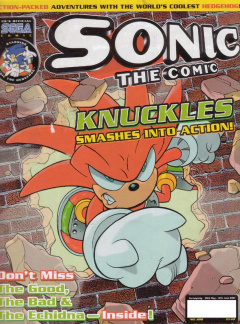 Sonic the Comic #208 is the two-hundred and eighth issue of the Sonic the Comic series by Fleetway Editions Ltd.
Graphic Zone: Fan art submitted by readers. The theme for this issue's Graphic Zone is "Tails Up! ", featuring a collection of drawings exclusively featuring Tails. Interestingly, this issue's Graphic Zone is similar in style to the very first Graphic Zone, where pictures are printed in no sort of format, just all over the page.